Seedless grape cultivars suitable for the Northeast are a relatively recent development. They are more challenging to grow in home plantings than other cultivars and require different practices. While moderately hardy, they may not perform well in colder sites. Even though they are less than perfect, their flavor far exceeds that of Thompson or Flame seedless grapes from the West Coast. Canadice—a hardy, productive, and popular vine, but berry size is small and bunch rot is often a problem. Himrod—a vigorous vine that has moderate resistance to disease, responds well to cultural practices, and produces a good white grape. Einset—a grape with excellent storage qualities, productivity, flavor, and hardiness, although some people do not like its thicker skin. Vanessa and Reliance—high-quality grapes, but with thin skins that are susceptible to cracking and diseases. Growing top-quality seedless grapes involves many time-consuming steps. Commercial growers spray gibberellic acid and use special tools to girdle trunks or individual fruiting canes to improve berry set and increase berry size. They also increase berry size by thinning individual berries from each cluster and thinning clusters before and after bloom. 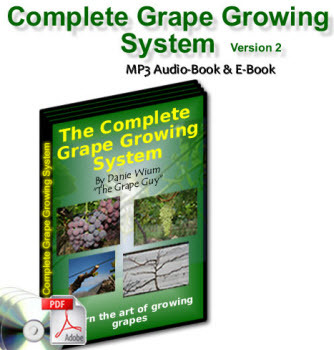 Home gardeners can grow seedless grapes without using all these commercial practices. The grapes will be just as flavorful but smaller than those found in the supermarket. A common system for training seedless grapes uses cross-arms on trellis posts up to 42 inches wide. Wires in the middle of the cross-arms support fruit canes. Catch wires at the ends of the cross-arms support the shoots. The wires position the fruit for easy harvest. Because seedless grapes tend to be large, they attract birds as well as raccoons. Diseases and insects also can cause more problems than with other varieties. Homegrown seedless grapes are smaller but usually are more flavorful than store-bought grapes.